Overall view ... the three batching plants for hollowcore and precast production. RDB-El Seif, a pioneer in concrete and member of Saudi Arabia’s El Seif group, has chosen Italy’s Marcantonini Concrete Technology (MCT) to build a state-of-the-art precast factory in Jizan in order to meet its housing project obligations in the kingdom’s southern border area. The factory, which is currently being commissioned, will support RDB-El Seif’s robust order book for the region. The company is currently working on a contract in the southern border region for design, engineering procurement, construction, testing and commissioning of a total of 4,520 residential units including 628 apartment buildings, 832 villas, schools, kindergartens, a sports club, mosques, shopping malls, petrol stations and military police buildings. RDB-El Seif chose MCT as the main contractor because of its ability to provide a high level of customisation and also due to the complexity of the project. It was selected as a partner in close cooperation with the local agency Philip A Tabone. The layout of the factory has been drawn up in close liaison between the two companies. “We went through a lot of hand sketches and then CAD drawings until we got everything designed to what we felt was the perfect layout from an efficient and flexibility standpoint,” says Renzo Arletti, CEO of RDB-El Seif. Massive equipment has been employed at the new factory giving RDB-El Seif the ability to produce up to 760 cu m per day of concrete for precast elements and 420 cu m per day of hollowcore slabs at full capacity. The hollowcore production facility is composed of 18 lines – 150 m each – with the MCT batching plant able to deliver, thanks to an incredibly fast concrete distribution system, says Gabriele Falchetti, MCT area manager for Middle East. 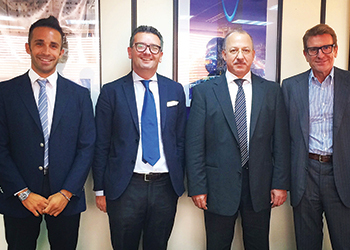 FROM LEFT: Falchetti, Anthony Tabone, president of Philip A Tabone, Allan Damen, vice-president of procurement of RDB-El Seif, and Arletti. 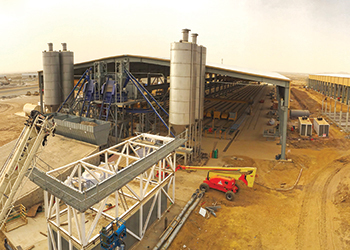 The batching plant is equipped with six aggregate bins with a total capacity of 180 cu m and two 3000/2000 planetary mixers. Concrete is transported via two AV 2000 high-speed flying buckets able to feed two gantry casting machines which can deliver the material in a fully automatic process to two extruder machines. 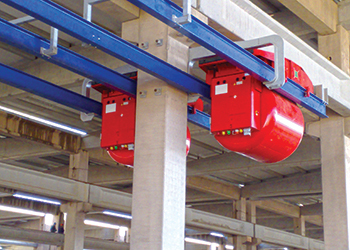 “MCT’s concrete distribution system is the result of years of dedicated efforts by its engineers to achieve maximum functionality, efficiency and reliability in the rapid transport of the concrete,” says Falchetti. “Flying buckets supplied to RDB-El Seif can transport dry concrete at a speed of 240 m per minute in a fast and controlled way so that material (fresh concrete) arrives at its destination swiftly without changing any of its characteristics. The precast production line, consisting of eight battery moulds, 120 tilting tables and some minor elements, is supported by two MCT concrete batching plants, each comprising two planetary mixers of 3000/2000 size. A total of 12 aggregates storage bins let the customer stock up to 360 cu m of raw material, ensuring greater autonomy in the production. According to Falchetti, one of the features that RDB-El Seif highly values is that the aggregates dosing system at all the three batching plants perform with their own mobile dosing scale. This gives the flexibility to install an additional hopper or mixer in the future; it also guarantees better dosing accuracy for the quantity of aggregates due to its reduced tare compared with classical dosing system. These units also ensure reduced cost of civil foundation works; and give the customer complete flexibility in positioning the mixers. MCT is completing the turnkey project with containerised ice flakes and chiller machines which can cool the temperature of the concrete down to 26 deg C, which is strictly required and controlled daily by the main contractor. The three ice flakes and chiller machines, supplied for each of the three batching plants, can deliver simultaneously ice flakes and cold water to every mixer, producing a total of 110 tonnes per day of ice flakes and 243 cu m per day of cold water at 4 deg C.
In order to conform to the temperature limit and guarantee the highest concrete quality production, MCT has installed Compumat software to manage the ice plants. “This software has been completely designed and realised by MCT in-house and, thanks to a high level of customisation, it enables the monitoring of all aspects and stages of the entire process of the concrete production and distribution system,” says Falchetti. Flying buckets ... run up to 240 m per minute. MCT’s relationship with the company dates back to 2007 when it first installed a precast factory for RDB-El Seif in Riyadh. This factory consistently produces 600 cu m per day of precast concrete elements, which include hollowcore slabs, walls and all precast elements used for industrial buildings. MCT has 49 years of experience in the precast field, which has given it an enormous amount of knowhow and earning it an excel lent reputation for supply batching plant and equipment. A company official says MCT’s unique selling point (USP) is its turnkey capability of designing and developing a precast factory, where the concrete batching plant and distribution system is fully integrated with the supply of hollowcore equipment, battery moulds and moulds for all kinds of precast element. Falchetti says the company has proven its capability of designing and delivering – including high quality machinery and equipment – for RDB-El Seif’s new project, with everything having been studied and manufactured according to customer’s detailed needs and requirements. El Seif Group is a leading privately owned group of companies founded in 1975. Its member company RDB-El Seif has become a premier precast company in the country offering a full range of products including hollowcore slabs, partition walls, columns, stairs and beams. In the last decade, El Seif has seen robust growth in terms of concrete production as well as financially through delivering high quality works, with the highest safety standards. It has built up an impressive portfolio of projects in Saudi Arabia and the UAE and is one of the largest construction groups in the region.